Communication Skills for the Healthcare Professionalis a comprehensive yet compact guide to learning essential communication skills that will prepare students for success as healthcare professionals. 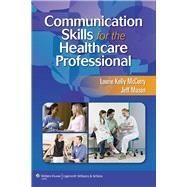 Intended to supplement the clinical coursework students complete in the first one to two years of all allied health programs, the book uses a broad range of examples, role plays, and scenarios from virtually every healthcare field, enabling both instructors and students to use it as an essential resource for mastering any area-specific communication skill. Each chapter provides students with objective and short-answer questions to test comprehension of the material, as well as more complex clinical applications that encourage students to develop the critical thinking skills they will need every day as professionals in the healthcare industry.